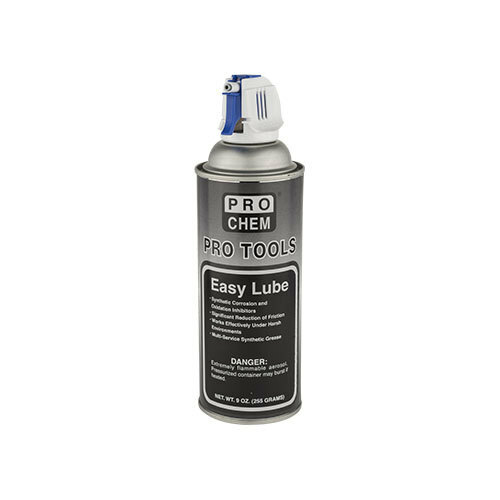 Pro Tools Easy Lube | Pro Chem, Inc. PRO TOOLS EASY LUBE is a multipurpose, synthetic grease that provides superior protection and lubrication, even under the harshest of conditions. It resists water washout and reduces maintenance costs by lasting longer than most lubricants. This unique product greatly reduces friction under both high temperatures and low temperatures and offers superior rust protection. Convenient trigger spray tip is not only easy to use, it is also more accurate than the old style sprayer tips. Shake well before using. Saturate area to be lubricated. Repeat as necessary.